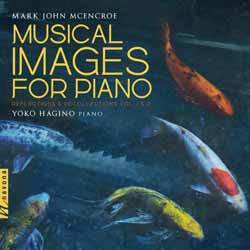 Mark John McEncroe's Musical Images for Piano does just what it says on the tin: delivers a collection of piano pieces that immediately conjure up images in the listener's mind. McEncroe draws his inspiration from the setting of his Japanese garden, but beyond that, does little to share his own stories. Instead, he encourages the listener to create an atmosphere where they can turn inward to give the compositions depth by associating them with their own memories... which it manages to achieve incredibly well. In this respect this will be an intimate and private experience for each and every listener, with no two experiences being the same. Yes, to some extent most works of Classical music mean different things to different ears, but there's a rather intimate feel to the proceedings that you don't often get. This is helped greatly not only by Yoko Hagino subtle playing, but also by the production values which make the recording sound as though Hagino is sat right there in your living room. The two volumes represent 24 tracks (2 hr, 14 min, 14 sec) of pure blissful listening pleasure that will entertain and delight for years to come. It's an album that will grow with you and mean different things to the listener at different times.